If you're looking for an effective and environmentally friendly way to keep your flooring and upholstery clean, a HAAN steam cleaner might be the ideal choice for you. These household small appliances are available in select retail stores, as well as from Amazon.com and QVC.com. They can also be ordered directly from HAANUSA.com. Find out if a HAAN steamer is right for you. If you don't like the idea of using chemical cleaners to remove dirt and dust from your floors furniture, and other household surfaces, a floor sanitizer from HAAN is an alternative that you may find to be appealing. HAAN steamers do not require any chemicals to function, making them an environmentally responsible option for house cleaning. This powerful appliance has the ability to clean and sanitize most types of flooring, as well as many soft household surfaces, using nothing more than water. HAAN floor sanitizers quite affordable, with a price point of less than $100 for the steam mop models, including an optional carpet cleaning attachment. The microfiber pads necessary for use with the machine are reusable and can be washed in a standard clothes washing machine. Designed for household use, the appliance is lightweight, compact, and easy to maneuver making it a good choice for homes of all sizes. It's very simple to assemble and to operate. When you're ready to steam clean your floors, simply add one and a half cups of water to the tank, allow thirty seconds for it to heat, and you'll have enough steam cleaning power to sanitize a 100 square foot area. The steam will last approximately fifteen minutes. 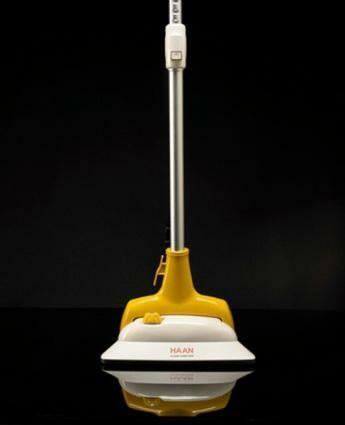 HAAN steam cleaners were developed by Romi Haan, a housewife and mom from Korea. In Haan's culture, it's traditional for homemakers to scrub their floors a number of times daily. She became determined to find an alternative to scrubbing her floors with a bucket of water and a mop, so she decided to take it upon herself to find a better way. After spending several years developing her idea, Haan's labors resulted in the first item in the HAAN steam cleaning product line. The line includes several floor cleaner styles, each of which cleans and sanitizes a variety of surfaces using steam that is emitted at 212 degrees. Because of the high temperature, HAAN sanitizers are able to remove up to 99.99 percent of many common germs and allergy inducing substances, including dust mites, as well as harmful organisms such as e.coli, and salmonella. The first HAAN steam cleaner was introduced to market in Korea in 2004, relying primarily on word-of-mouth marketing. When the product was featured on a Korean television shopping network, sales exploded. It was an immediate hit, and within five years the product line was expanded to include additional items, introduced into the international market, and achieved sales of approximately $100 million per year. HAAN floor sanitizers can be used to safely and effectively clean a variety of household surfaces, including floors, countertops, furniture and more. The HAAN family of products includes several types of floor cleaners and accessories, as well as garment steamers. Visit the product page on the company's website for complete details about available models. Is a Haan Steamer Right for You? Are you still unsure of whether a Haan steamer might be a good addition to your inventory of household cleaning tools? To learn more, check out the actual customer reviews reviews at QVC.com.